I just had a look at the WWDC 2004 keynote (did I see Francis Ford Coppola in the audience a couple of times?). 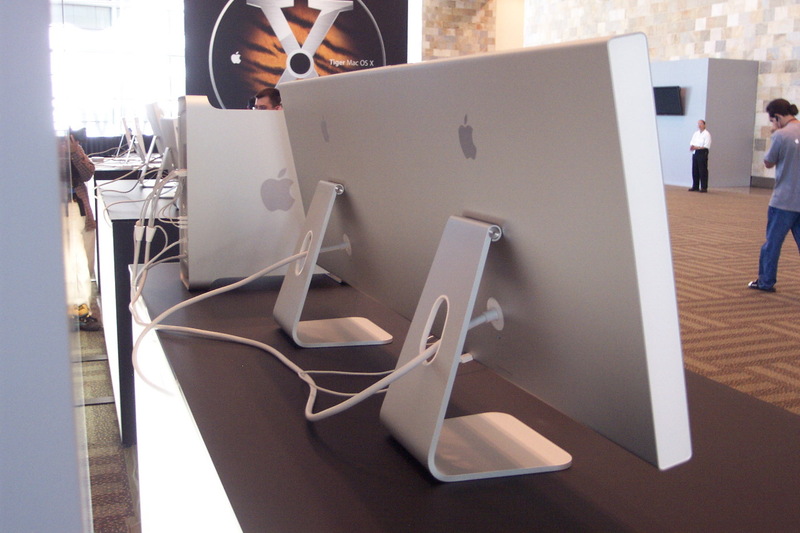 The upcoming release vo Mac OS X 10.4 Tiger comes with a collection of features that in general appear to be focussing on productivity and efficiency. 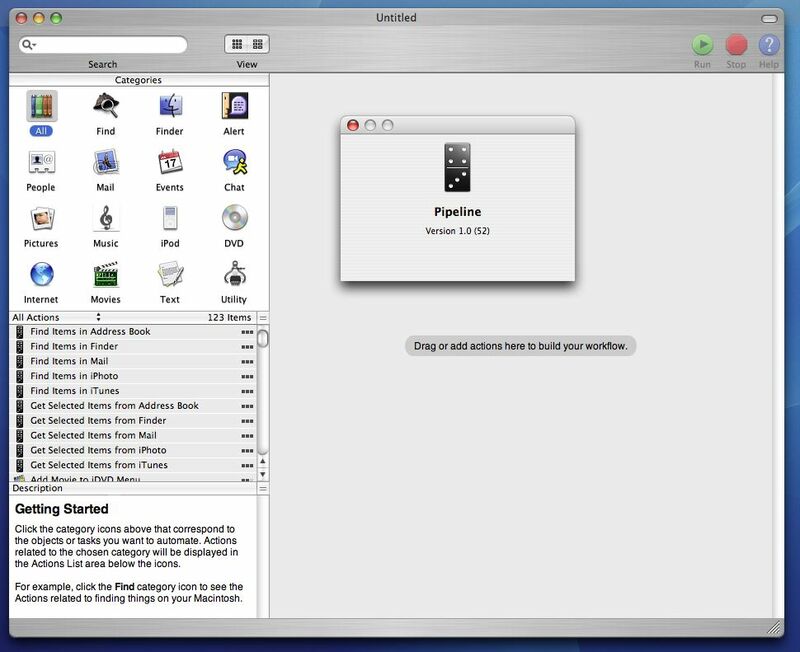 Spotlight – the instant searching – and Automator (Screenshot)- an application to pipeline AppleScripts visually – will make a great pair. And I don’t even want to imagine the productivity leaps that are hidden in Core Image or the H.264 codec. iChats multiparty conferencing is great, but I’d have loved to see screen sharing and being able to give remote presentations with keynote. I don’t know if I will ever be able to work on that 30″ inch display, but I am sure that such a screen will change the way layouts are done on a computer (I pass an Apple dealer once in a while I am will need to have a look at this beast…). 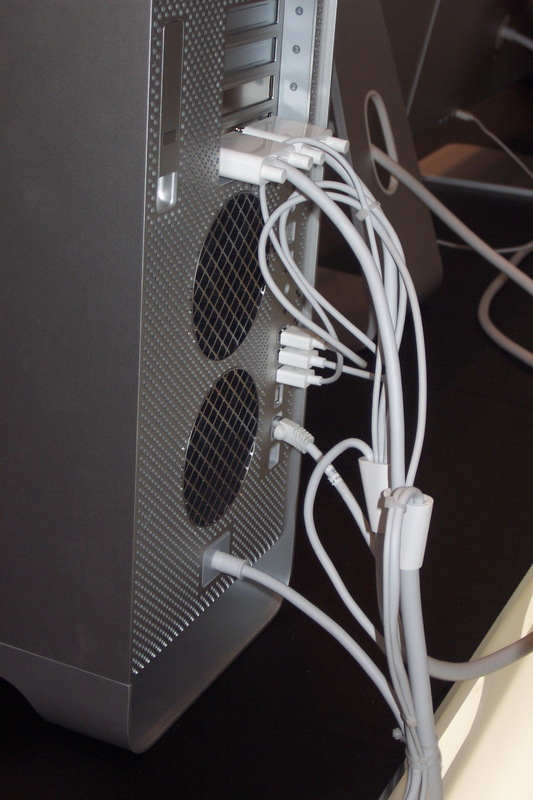 Unfortunatly the 30″ inch version will never pair with PowerBooks, because a special graphic card is required to run a screen with 4.1 million pixels (and it can even drive two of these giant displays with weird cables). What I am wondering is that Apple again integrates functionality that is currently making a living for some small developers: Dashboard is clearly a Konfabulator clone. It is like a deja-vu of Sherlock 3 becoming a Watson clone. Dashboard and Sherlock are “stolen ideas” and cause a threat to small developers that need to be fearful if Apple is going to steal their tool on the next OS release. This is especially amazing because neither Sherlock 3 nor Dashboard seem to be killer applications: they are more like fancy examples of interface add-ons. An insider comment claims Steve Jobs may not have seen Konfabulator (but in fact Jobs is claiming Konfabulator stole the idea from the older Apple MacOS in the first place). Safari RSS (and it is not called “Safari ATOM”!) is different: while it may to some degree kill NetNewsWire Lite I do think that it could be more dangerous to OmniWeb & other commercial web browsers. Brent Simmons (author of NetNewsWire) comments on this. NetNewsWire Pro may even increase sales, because everybody will learn about RSS and Atom. Interesting stuff also can be found in the sneak peek page for Tiger Server: there will be a weblog server integrated in Tiger based on Blojsom – apparently a JAVA based Bloxsom clone. So we’ll see a new release of the Microsoft Windows in 2006. That’s two years from now. In contrast to Tiger, the hardware demands for Longhorn seem to be dramatic: for a full Longhorn experience you need hardware that has yet to be produced. But by 2006 I will probably already comment on the first releases of of Tiger’s successor which may still run OK on my 2003 17-inch PowerBook (as Panther does right now on my 2001 15-inch PowerBook).